I will be published again soon. Yesterday I got an email from the San Mateo County Fair Literacy Contest. My audio story, “The Intellecta Rhapsody,” won first place in the audiobook division, and my short story, “The Lutefisk Door,” won third place in the scifi/fantasy senior division. Yay, I will be in Carry The Light again! Looks like my Trumpy villain Billington Stumpfinger will be in print soon (in “The Lutefisk Door”, he built some nasty walls to trap Super Holly Hansson). I’m honorably published in a paperback! 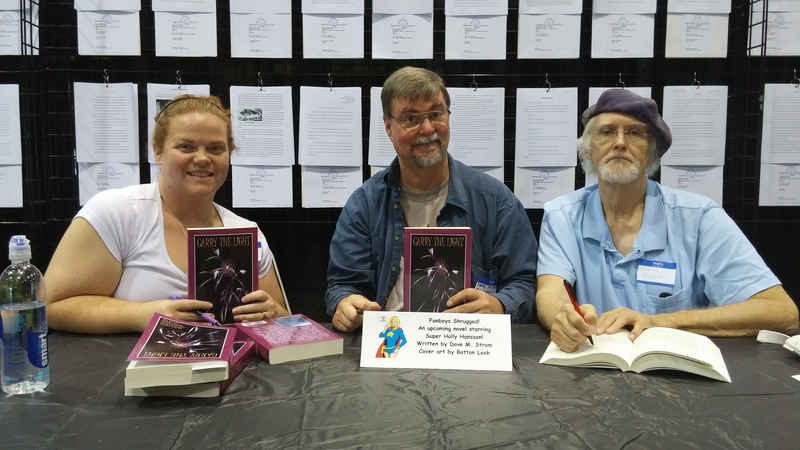 I sat at the signing table and signed my chapter in that book. Don’t I look happy? Okay, it was mostly other writers passing their Carry The Light books, signing each other’s stories. But it was fun! I felt like Holly Hansson! (Chapter Zero has her at a signing table in a comic book and coffee shop.) I took a picture at the signing table. (This is staged. The signing was over, so I had a couple of the writers pose with me.) Missy Kirtley is on one side of me, William Albert Baldwin on the other side, and in front of me is the little placard I made. Missy has a kid superhero story in Carry the Light! KEWL! This makes three published Super Holly stories. I still have one to finish and submit to Fault Zone by June 30 (deadline was extended), and two others to put out on Kindle. P.S. I’ve been published on paper before. I used to write the Strom’s Index column for Amazing Heroes magazine. But that was back in the days of Jack Nicholson’s Joker. P.P.S. I found a typo in my chapter. My fault. Sigh. I am being HONOR(able mention)ED! And published again. Carry The Light is an anthology from SF peninsula writers. You can link to previous versions here (but I am not in those). I got an honorable mention for the first chapter in my novel. Chapter Zero, Holly Hansson’s Superpowered Origin Story. I think nearly everyone who enters gets into Carry The Light, but I also think that not everyone gets a prize. I took my prize: a couple of Beth’s ebooks for authors. I am reading The Writer’s Adventure. It’s good. I will post a link when the 2015 edition with MY TOTALLY AWESOME NOVEL CHAPTER is published. If you are going to the San Mateo County Fair, you can likely buy a hardcopy at the fine arts stage. Also, it will likely be sold through Amazon. I’ll buy both. First time I will be in a printed book, if you don’t count technical manuals or my old Strom’s Index column. I will be editing my novel chapter on the advice of the pro editor. She wanted more description of the comic book shop. It is another chance to geek up my writing! The pro editor liked Kittygirl and her mom in this chapter, by the way, so I intend to send her a copy of my Kittygirl short story after my final polish. I think she’d like it. I also changed the name of my novel from The Comic Book Code to Fanboys Shrugged. I’d rather satirize Atlas Shrugged than The DaVinci Code in my title. But I will likely have a chapter named The Comic Book Code. And I have set a goal: finish the entire first draft by my birthday in October as a present to myself. I will be the big SIX-O. Who’s on first? Who’s on third? The reader should be, that’s who! As in First Person instead of Third Person. As in writing, “My head hurt,” instead of, “Holly’s head hurt.” Which one makes you feel Holly’s pain? Question: Which one puts you in the driver’s seat? Answer: It hurts more if it is your head that hurts. 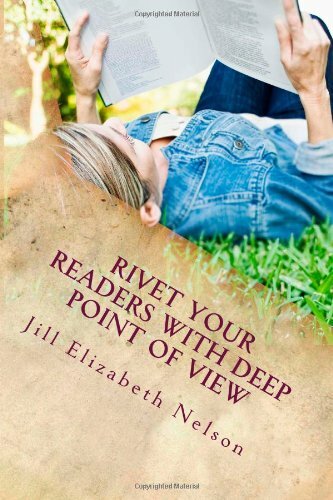 The book “Rivet Your Readers with Deep Point Of View” by Jill Elizabeth Nelson discusses getting into the POV character’s head, even when you are writing third person. Lots of good advice in that book. It set me on the POV path. But there is another way to get close POV. Write in first person. It forces you to get into the POV head and STAY THERE! So I will rewrite my short stories to be first person. Yes, even the bad hair day story, which really should have been on Amazon by now! I think the novel will still be in third person (as in close third, deep POV) because it will have more than one POV character. maybe I’ll write the novel chapters in first person, and then find and replace “I” with the name of the POV character.